Welcome to 2017 International Conference in Sydney, Australia! 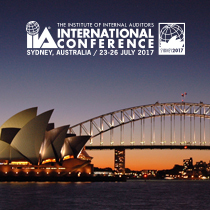 Mark your calendar as busy on 23–26 July 2017: the official dates for The IIA’s 2017 International Conference in Sydney, Australia. Get ready to learn like never before as you L.I.V.E. the Global Experience at The IIA’s 2017 International Conference in Sydney, Australia. With a focus on “Leadership. Innovation. Value. Effectiveness.” — our technology-driven program is customizable to specific niche and training needs. We promise a world-class event, rich with insights for internal auditors at every level. No other conference provides the opportunity to network with 1,000+ like-minded mates from more than 100 countries, experience a world-class event with 65 dynamic sessions, and immerse yourself in the exquisite beauty of the Harbour City, Oz. Because you will save up to AUD$220 when you register by 12 midnight (DST) of 31 March 2017 and you will enjoy 2.5 days of technology-driven learning, sharing, and networking in the Harbour City, Oz — one of the most lively and laidback cities in the world. We are planning a customizable program designed to meet your professional needs, including 70 sessions covering 10 distinct educational streams — such as People And Relationships, Public Sector, IT Auditing, Financial Services, and more. Focusing on the best emerging global practices and cutting-edge pre-conference workshops, the conference promises a variety of educational and inspiring events. Plus opportunities to network with professionals from around the world. Don’t delay, register now, and L.I.V.E. the Global Experience: Leadership. Innovation. Value. Effectiveness. P.S. Why not make The IIA’s 2017 International Conference a team learning experience? Ask about our group rates and get your entire department involved. Contact at us at iia2017@arinex.com.au or call​ +61 2 9265 0700.